Ho hum, Brian McFarlane has another book out this year. You think I would absolutely love Brian McFarlane. And I do, really. The guy has churned over 50 hockey books, most of them about hockey history. Anyone who has read my work for any length of time knows my two favorite things are hockey books and hockey history. In fact, my approach is very similar to his, and that is no accident. Over the years McFarlane has definitely helped to create my love of hockey, as I devoured many of his titles. But, and you knew a but was coming, somehow I no longer pay enough respect to McFarlane of his work. Why? Because I've read too many of his books, and they tend to be formulaic and repetitive. That is an unfair assessment of any single book of his, especially his new book Legendary Stanley Cup Stories. It is an excellent book, so long as you are not overly familiar with McFarlane's work. You can take any of his books and you will find his work to be entertaining, informative and well worth the read. Legendary Stanley Cup Stories is no different. Many of the greatest stories, myths and legends are expertly retold by McFarlane. Stories like that of the Silver Fox's taking to the nets, Mel Hill's sudden death heroics, Bill Barilko's triumph and tragedy, the Rocket Richard Riots, Bobby Baun's broken leg goal and Messier's Manhattan transfer. If you are a long time reader of McFarlane, you may notice that many of these stories have been told in previous books. He offers little that is new. You may be better off searching for his 2000 release Brian McFarlane's World of Hockey. That book was a highly personal and insightful autobiography by McFarlane, one of the longest serving journalists in hockey alive today. That McFarlane book absolutely blew me away. But if you are uninitiated in the wonderful world of Brian McFarlane, this is an excellent introduction. You are guaranteed a real educational extravaganza and, just as importantly, a fun read. It's not quite the same as lifting the Stanley Cup over your head, but it is a great way to experience the trophy that grown men spend lifetimes and millions of dollars trying to win. 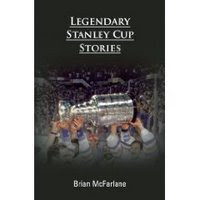 Brian McFarlane's Legendary Stanley Cup Stories is published by HB Fenn.